and other shocking revelations about their breakup in this throwback interview. Born in Italy, brought up in Switzerland—Rosa Catalano was the next big name that was hugely popular in Bollywood in the last decade when Saif had just gotten out of his failed marriage with Amrita Singh. Saif and Rosa were seen everywhere— be it parties, events, award shows et al. and Saif looked much happier than before. But that relationship too could not stand the test of time, and the two parted ways after living-in together. Rosa's broken heart could be sensed in several interviews, and even though she tried to keep a calm facade, she eventually caved in to her emotions and revealed a lot about why did she and Saif part ways, despite the fact that she was still very much in love with him. It started with a chance meeting in Kenya, before it blossomed into a full-blown relationship oozing with love! Surprisingly, Rosa revealed in this interview to a leading channel that Saif had kept his marriage, and existence of his children, a secret from her. It was only when she came to India, and started spending time here when she learned about his divorce and kids. However, Rosa was very attached to Saif's children, Sara and Ibrahim and being away from them after her breakup had torn her apart. She had mentioned that they had significantly helped her adjust to a new country, and will always love them madly. Back when the duo was on the verge of a split, city-based designer Suchismita Dasgupta, who was friends with them ever since the actor came down to Kolkata to shoot for Parineeta, spoke to Rosa on Saturday evening. "She was on the verge of tears when she confirmed the news of their split. She said that she couldn't deal with Saif's mood swings any longer.When Saif was working, he got hyper and changed into a completely different person. He wouldn't be talking to Rosa for days on end if he was tense with work. Though Rosa is very worried about Saif's health, she can do little to find out how he is doing now. She told me that they are not on talking terms at present," she said. "I asked myself what, why and how things happened. But a person grows and realises things even though they are shocking. Plus, you don't know what other people are thinking or doing. Just one person can't do that because the effort has to be from both the sides. It takes two people to actually make something work. Otherwise it's like being on the same boat where one person wants to go right and the other person wants to go left." 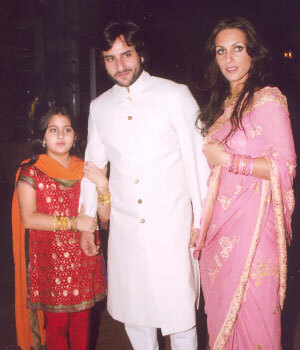 There were rumours afloat about Rosa accruing alimony from Saif after their split, which she categorically denied. "Saif is not supporting me financially. The one reason why I kept staying in India was because I used to work as and when projects used to come so that I was able to pay my bills and pay my rent. And no one ever, I repeat, no one ever has paid my bills in India." We wonder how such candid confessions from Rosa Catalano didn't spark much controversy back then, but sincerely hope Rosa has moved on and has let bygones be bygones. We know Saif has!